In this section you will find information on what cookies may be set when you visit the Archdiocese of Liverpool website and how to reject or delete those cookies. Please be aware that restricting cookies may impact on the functionality of the Archdiocese of Liverpool website. 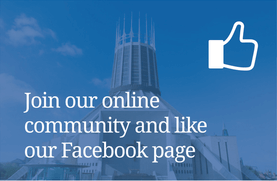 Archdiocese of Liverpool also use a number of suppliers who also set cookies on our website on its behalf in order to deliver the services that they are providing. If you would like more information about the cookies used by these suppliers, as well as information on how to opt-out, please see their individual privacy policies listed below. Archdiocese of Liverpool website uses Google Analytics, a web analytics service provided by Google, Inc. Google Analytics sets a cookie in order to evaluate your use of the website and compile reports for us on activity. Google stores the information collected by the cookie on servers in the United States. Google may also transfer this information to third parties where required to do so by law, or where such third parties process the information on Google’s behalf. Google will not associate your IP address with any other data held by Google. By using our website, you consent to the processing of data about you by Google in the manner and for the purposes set out above.